The World Health Organization reports that some of the most common chronic respiratory diseases include asthma, chronic obstructive pulmonary disease (COPD), and pulmonary hypertension, the last of which is high blood pressure in the arteries connecting the heart and lungs. Though some of these conditions can be passed down through genetics, lifestyle factors play a role as well, with risks rising with increased exposure to cigarette smoke, high levels of air pollution, and chemicals and other toxins found in various work or home environments. Obviously, your genes are your genes and removing these types of environmental toxins can go a long way to avoiding the development of lung-based diseases. Find out how Chiropractic care plays a positive roll. A Study Shows Regular Chiropractic Visits Can Help! 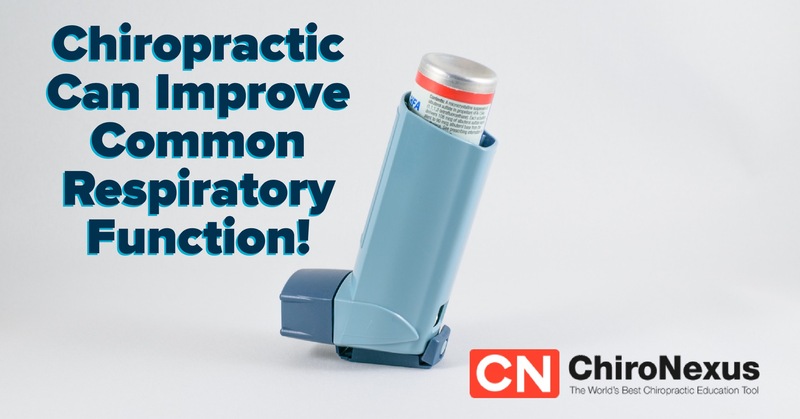 One study has discovered that another way to keep your lungs breathing easier is with regular chiropractic visits. In September of 2016, the Journal of Physical Therapy Science published a study involving 30 subjects between the ages of 20 and 38 who were not currently being treated for any type of respiratory issue, nor were they experiencing any pain in their thoracic region. One-half were randomly assigned to an experimental group, which is the group that received actual spinal manipulation therapy. The remainders were assigned to the control, receiving sham treatments instead. At the onset of the study, each subject’s respiratory function was tested and recorded. Approximately ten minutes later, depending on which group they were in, they either received high-velocity, low-amplitude manipulation directed to the thoracic area of the spine or sham chiropractic. Follow-up respiratory testing occurred immediately following the actual or sham treatment session. After studying the lung-function data collected, researchers noted that the experimental group, which is the group that received actual chiropractic, had “significantly increased” their forced vital capacity and forced expiratory volume in one second. The group that received the sham treatments experienced no difference in their respiratory function at all. These findings suggests that chiropractic care likely plays a more important role in healthy lung function than most people realize. This information may be helpful to patients who are already experiencing chronic respiratory issues and looking for relief, but it may also work to reduce the likelihood of lung-related diseases in the first place. As the COPD Foundation states, generally speaking, “once lung function is gone, it is gone for good.” That’s why they recommend engaging in activities which can maximize lung capacity. These include: getting some type of regular exercise, performing physically demanding exercises during the times when it’s easier to breathe, and staying indoors when extreme temperatures are expected or pollution is high.